SARASOTA, Fla. — A student and his family are apologizing after the teen's racially offensive promposal went viral, prompting an investigation by the Sarasota County School District. 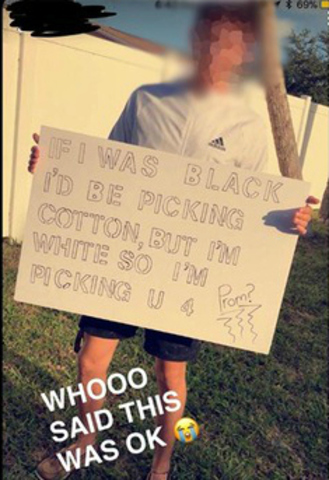 The image, posted on Snapchat, shows a Riverview High School senior holding a sign that reads, "If I was Black I'd be picking cotton, but I'm white so I'm picking U 4 Prom?" When the image began to circulate, it sparked outrage online. Shortly thereafter, the school district launched an investigation over its concern that the image could be a disruptor to the school and student safety. The district sent out a message to students and parents on Monday morning. "I want to sincerely apologize if I have offended anyone with the picture going around. That was not my intention. Anyone who knows me or [name redacted] knows that that's not how we truly feel. It was a completely joke and it went too far. After reading the texts and Snapchat's I truly see how I have offended people and I'm sorry." "While our son has apologized himself, on behalf of our family, we wish to also express our most sincere apologies for the terrible words used in his “promposal.” We love our son dearly and know that he is a far better person than reflected in this reckless behavior. That said, as loving parents, we also feel compelled to share our own deep regret and serious concern about his actions. After numerous familial conversations and lengthy discussions with Riverview High School administrators, we have jointly agreed that our son will not be attending any further school activities or functions, including the Prom or graduation ceremony. As a family, we truly recognize this incident is a very difficult but important life lesson and pledge to do all we can to ensure that nothing like this ever happens again. Certainly, we hope that all of the people and communities who were hurt and offended will forgive our son and family." On Monday, the district says a "diverse cross-section of students" met with school officials to talk about various issues including economic, racial, ethnic and gender disparities. The students reportedly voiced their concerns about racial tensions at the school. Following the incident, the school district invited Trevor Harvey with the Sarasota NAACP chapter to facilitate a student-led conversation at Riverview High School to learn more and share ideas for change. "We believe our students can be powerful voices of reason and help us fund solutions to the racial alienation that some children may feel. It is our goal that these roundtable discussions take place at other schools throughout the district to directly hear from students about these topics that are national in scope, but important to our community," the district wrote in a press release Tuesday night. "From there, we will make resources available to our students to effectively address the issue of inequality in our schools." The school district says the investigation on the incident is still ongoing. "We are working with school administrators, students and their parents to determine a course of disciplinary action according to school policy," the district says.